As opposed to a closed radiant heating system, the open solar radiant heating system uses no heat exchangers (read: losses) nor a separate boiler system (read: expense). The open solar radiant heating system uses one heat source to provide radiant heating and domestic hot water to a home or building. The amount of hot water that you need is something that a professional can help you figure out when designing the system. When we refer to one heat source, this can be a Sunbank with an electric element installed, or a Sunbank pre-heating a water heater with or without storage (tankless). 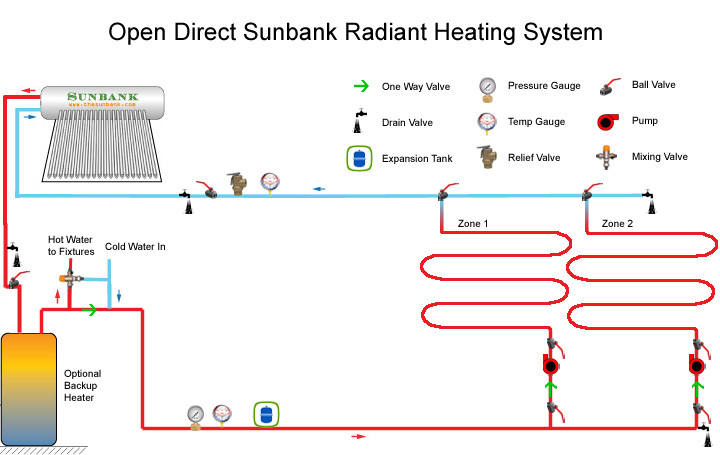 If the solution calls for the latter, then it is likely that the Sunbank can provide all of the hot water in the months when radiant heating is not used and the backup heater kicks in during winter months. With this setup, the same water that you use to clean your dishes or take a shower, goes through the floor first. This is very efficient because one heat source is doing all the work, while you are using solar energy and the need for an expensive boiler system is eliminated. In the summer, the cold water traveling through the floor is warming up before it gets to the water heater. This provides free cooling to the house and free heat to the domestic water. Is cold water going through the radiant heating system? Cold water enters the water heater through the floor tubing. The system is plumbed this way so that there’s no chance of stagnant water entering your domestic system. Fresh water enters the tubing every time you use hot water. Although it looks as if the water will be cooling down your floor, in reality that will not happen. The only cold water that can enter the tubing will be the “make up” water to your water heater. If no hot water faucets are open in your domestic system, the radiant system is essentially closed. Without an open hot water valve, only the circulator pump supplying the radiant tubing can force water from the water heater into the tubing, and back, when your zone calls for heat. Any hot water displaced by the cold make-up water eventually works its way to the water heater, so there’s no net energy loss. And due to the large thermal mass in the floor, the small amount of cold make-up water entering the tubing has no chance of cooling down the floor. Unless, of course, you were to take a four-hour shower. Also remember that if the thermostat in the zone is calling for heat at the same time you are using hot water, then the circulator pump will still be pumping hot water through the loops and the net result will be warm water entering the tubing instead of cold. But if the radiant circulators are running, will the floor steal hot water from my shower? They will not. The circulators should be very low wattage, non self-priming pumps. They can circulate water through a radiant system, but they cannot compete with normal domestic water pressure. As a result, domestic hot water uses always take precedence. In summary, this is a very efficient system that will maximize the use of heat from your solar thermal system. 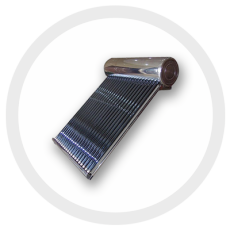 It enables your solar water heater to be used for both domestic and radiant heating year-round.